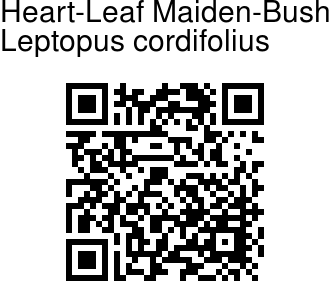 Heart-Leaf Maiden-Bush is a small shrub, 1-1.5 m, occasionally up to 2.5 m tall. Young shoots are very sparingly velvet-hairy, soon hairless. Leaf-stalks are 0.5-2.5 cm. Leaves are triangular-ovate to elliptic-ovate, 2-5 x 1-2 cm, rounded to notched at the tip, flat or shallowly heart-shaped at the base. Leaves are thinly membranous, lateral nerves 3-8 pairs, medium green above, paler beneath. Stipules are triangular-lanceshaped, 1 mm long, pointed. Male flowers are borne in pairs or in few-flowered fascicles, on selnder stalks 0.5-1 cm long. Sepals are elliptic-obovate, 2.5-3 mm long, fused at the base, pale greenish-yellow. Petals are obovate-spoon-shaped, 2 mm long, rounded or notched, yellow. Stamens are fused at base, filaments about 1 mm long. Female flowers occur singly, or sometimes accompanied by a male flower in the same axil. Flower-stalks are 3-4 cm long, slender. Sepals are nearly circular to ovate, 2 x 1.5 mm, enlarging to 3-4 x 2.5 in fruit, fused at the base, 3-5-ribbed. Petals are minute, disc annular, 2-3 mm diameter, ovary spherical, 2 mm diameter. Styles are bifid almost to the base, 1 mm long. 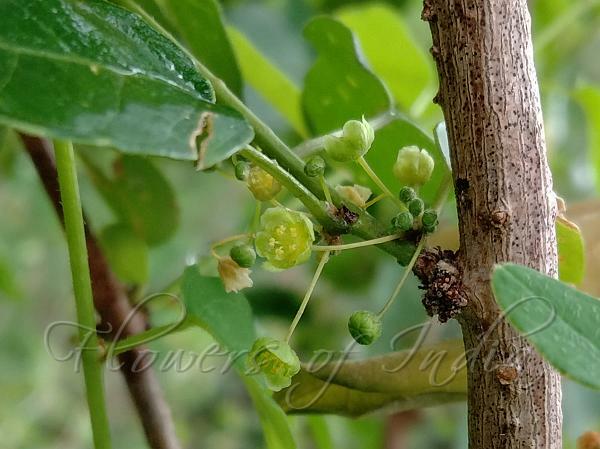 Fruits are roundly trilobate, 3-5 mm long, 6-7 mm diameter, smooth. Seeds are 3 x 2 mm, smooth, dull, pale brown. Heart-Leaf Maiden-Bush	is found in the Himalayas, from Kashmir to Nepal, Tibet, Burma and S. China, at altitudes of 1200-2100 m. Flowering: June-October. Photographed in Uttarakhand & Jammu & Kashmir.